The lapse of hardware patents on retro platforms has resulted in an explosion of clone machines, most of which are produced cheaply in the Far East. These systems emulate the performance of consoles such as the NES, Super Nintendo and Genesis/Mega Drive, all of which are no longer covered by their original manufacturer’s patents, which expire after 20 years. While we can imagine that Nintendo and SEGA aren’t exactly thrilled that low-cost variants of their machines are being created and sold, the appearance of such devices has been something of a boon for retro gamers. Not only does it allow players to purchase new hardware when their own consoles fail, but it also allows a certain degree of wish fulfilment to take place. 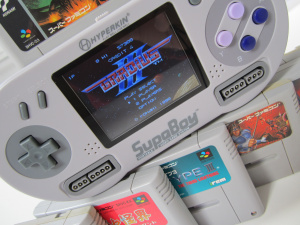 There can be few Super NES owners who would have turned their noses up to the idea of a portable version of their beloved 16-bit console back in the '90s, and the Hyperkin SupaBoy makes that possible. The SupaBoy isn’t the first machine of this type; we covered the Yobo FC-16 Go a few years ago, and that too offered the ability to take your SNES collection on the road. However, Hyperkin’s reputation is quite high among retro players, which goes a long way to explaining why there’s been so much interest in the machine. When you consider the size of SNES carts, it’s almost a given that any portable system is going to have to be pretty bulky to accommodate them. Even so, you’re unlikely to be prepared for the sheer girth of the SupaBoy; compared to modern portables, it looks like some kind of monster. Needless to say, Atari Lynx veterans will feel right at home with this huge beast in their palms. That bulk hides some cool additional features, the most appealing of which has to be the twin joypad ports, allowing you to hook up your existing SNES controllers. You can then plug the SupaBoy into your TV using the composite connect provided, effectively turning the device into a fully-fledged domestic system. While the dimensions of the system do hinder its mobile aspirations, they actually make it quite a comfortable machine to play on. The hand-cramp that is so common on dinky systems like the 3DS and DSi is nowhere to be seen, and the slightly-enlarged D-Pad feels as good as the one seen on the original SNES controller, if not better. In fact, all of the buttons on the SupaBoy feel good, with plenty of travel and lots of responsiveness. 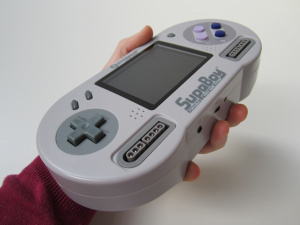 According to reports online, early versions of the SupaBoy suffered from control issues, but we experienced no such issues on our review unit. Clone systems are made on the cheap, so it’s almost a given that the screens they use are of low quality. While the LCD display on the SupaBoy certainly isn’t the best we’ve ever seen, it’s far from being the worst. The brightness could be better, but there’s very little in the way of motion blur, and colours are generally decent. Unfortunately, the screen appears to be something of a hungry beast when it comes to power consumption — the SupaBoy’s rechargeable battery is only good for around two and a half hours of play, and we can only assume that low figure is due to the screen’s energy demands. Because clone systems are basically emulating the performance of retro hardware, ensuring 100% compatibility with all games is nearly impossible. The SupaBoy fares better than many of its rivals though, and will run almost every Japanese or North American SNES/Super Famicom game you throw at it. European PAL carts present a slightly different story; because the SupaBoy basically acts like a NTSC US SNES, PAL games that feature region locks will refuse to play. The biggest shortcoming of the SupaBoy is its questionable build quality; as you might expect from a clone device, it isn’t constructed from the same high-grade materials as official Nintendo hardware. The plastic casing bends under the slightest pressure, and we noticed little imperfections — such as marks under the screen cover — that hint at a less than stellar quality control process. Such issues come with the territory, though; it’s unrealistic to think that a small firm like Hyperkin can match the production standards of massive corporations like Sony and Nintendo. And as annoying as build quality problems may been, they’re hardly deal breakers and don’t impact the overall usability of the device. If already have a large collection of SNES carts and are looking to give your retro gaming a semblance of portability, the SupaBoy is worthy of investigation. Stone Age Gamer provided a SupaBoy unit for review. The machine can be ordered direct from the Stone Age Gamer store and retails for $74.99. Quite expensive for a portable retro system. I like that you don't have to do any surgery on the console to play Super Famicom games though, and that you can lock the games in. I'll just get another replacement FC-16 Go though, since it's cheaper and works very well (used to have one, but was stolen). Have my original SNES but still tempted to get this! @Portista I know some Nintendo systems have interchangeable composite cable such as the N64 to the Gamecube. I thought the Super Nintendo was compatible with the same cable so if you can track down a gamecube composite cable you should be good to go. 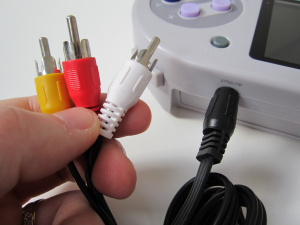 Yep, just confirmed that Super Nintendo through Gamecube all have compatible composite cables and I actually found one for sale for $8 free shipping http://www.buy.com/th/s-video-to-composite-cable.html. Scroll down a bit, I think it's the third row of items. Yes! It has two extra controller ports so you can play Secret of Mana with two of your friends. And best of all, it fits right into your pocket. I finally broke down and ordered one last week. It is a very nice system. And guess what? My copy of Super Mario RPG actually works on this unit! Does it still play games that use the Super FX chip? (Starfox, Yoshi's Island and Doom used it) I heard somewhere that it isn't easy to emulate games that use it, which would explain why these games aren't on Virtual Console. Not to pee on the parade here with the review as it really is well done I want to throw out there that this device is subpar junk compared to a newer one on the market called the Retro Duo Portable. RetroDuo has some consoles out with higher end but dubious compatibility with SNES games (chipped games to be exact) but in the portable they fixed it. IT IS THE ONLY CLONE TO RUN CHIPPED GAMES, ALL OF THEM — Starfox 1+2, SMRPG, Kirby's Super Star/Dream Land 3, DOOM, Yoshi's Island, Megaman X2/X3, and the rest. I don't recall if I can drop links in here, but if you look up Satoshi Matrix the user name on google there's a 4 part review on youtube showing the system and its capabilities to run it all. @Gamesake You better have humongous pockets then. I don't think it would be too practical to haul around snes cartridges if you decided you wanted to play a different game... personally I wouldn't be comfortable taking an snes cart out of the home anyway. I would not want my cartridges to get damaged in some kind of way. @TeeJay Good cargo pants. Two controllers in one pocket, handheld unit in the other and I bet you look awesome when your pockets are all full like that. One day when I'm feeling bored, I plan to book a first-class flight and don my best vestments. Once we get in the air and everyone around me is playing with iPads, I shall lower my sunglasses (stored securely on my head) and then proceed to whip this baby out, volume at max. @warioswoods That would be fantastic. I was too young to realize, but i probably looked the same when I'd play my GB with the attached magnifying glass/light/ fold out stereo speakers.... I remember people laughing. But it was perfect. I'm definitely interested in this thing... I'll look around. Eh, I still wanna land a real SNes off eBay; one that's still whiteish gray, & still functioning. If I went w/ an actual clone, I'd go for those Nes/SNes/MD/dual cart loader clones. I have one, My wife bought it for my birthday, I have been pleased with everything about it, except after owning it for a couple weeks my screen started getting fuzzy. It got worse and worse until it finally stopped working. i was able to hear noise but only had a blue screen. Luckly my brother was able to replace the screen with an $20 lcd we got offline. Now it looks better than before. Sweet. Might pick one up. This is pretty epic, never heard of one before, now I really want one. I bought a SNES and four games for 10 dollars from a friend a while ago. The games are Link to the Past, Super Mario Kart, and then two unmemorable ones. I wasn't able to play them because the place where the cord connects to the system is a broken hole and doesn't connect to the power outlet. Perhaps I should get this. its pretty cool, im tempted to get it. that would be awsome if someone would make a portable N64, i would get it as soon as i saw it. Have an SNES, so don't really need this, but if I had the extra money I'd get this for sure! 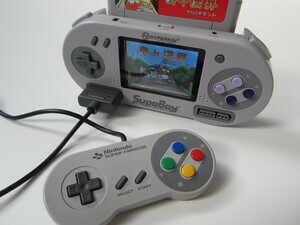 i like the idea of playing SNES, genesis/megadrive games on the go, so this will be very practical. i'd wait for the price to drop though before considering picking this one up. @ BLADE-9-SORA-9-, I'm sure that once the PS1 hits the big 20, you'll start seeing them. The 20 year patent thing ending is why the SNES/Genesis ones can be made. Hopefully in like 10 years time we'll get a GameCube one! The disks are small enough. Dang, I might need to get one of these sometime! @DarkEdi "The machine can be ordered direct from the Stone Age Gamer store and retails for $74.99." I would just like to say that if you take both of the screen protectors off it looks much better. There are 2 of them on there ya know. One of them is super thin but not really clear. Just recently pick this one up and loving it.